Apple’s got a slew of patents on multitouch technology, but it’s just won a bunch more. And guess what? On future iPads and iPhones, gestures are going to get a whole lot funkier–and you may not have to touch the screen. Apple’s got a slew of patents on multitouch technology, but it’s just won a bunch more. And guess what? On future iPads and iPhones, gestures are going to get a whole lot funkier–and you may not have to touch the screen (solves the greasy glass issue). We’ve watched Apple’s multitouch patents for a long time–including observing the debate on whether or not Apple “owns” multitouch as a technology (a fact that’s affected Google’s Android plans, before). They’re extensive and clever, and we’ve not seen all of them arrive in real life on devices yet since some of them are certainly defensive patents rather than ones for actual gizmos. But the newest bunch almost certainly hints that in the future you’ll interact with your iPhone or iPad in far more sophisticated ways. “Real-world” gestures such as hand or finger movements/orientations that are generally recognized to mean certain things (e.g., an “OK” hand signal generally indicates an affirmative response) can be interpreted by a touch or hover sensitive device to more efficiently and accurately effect intended operations. 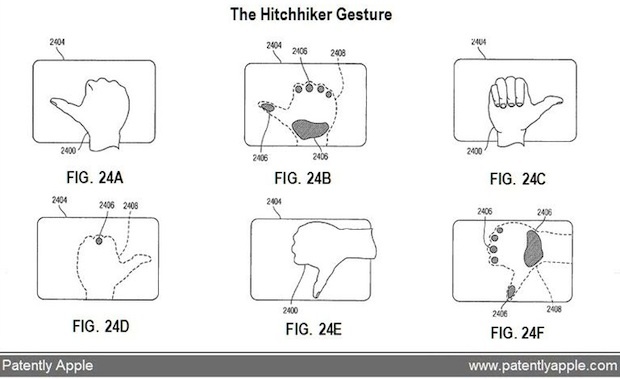 These gestures can include, but are not limited to, “OK gestures,” “grasp everything gestures,” “stamp of approval gestures,” “circle select gestures,” “X to delete gestures,” “knock to inquire gestures,” “hitchhiker directional gestures,” and “shape gestures.” In addition, gestures can be used to provide identification and allow or deny access to applications, files, and the like. As you can see from the images, Apple’s worked out a way to easily identify your hand shapes in much more sophisticated ways than its touchscreen tech does at the moment: As well as the movements of one or several fingertips, the idea is that you can use your whole hand to make complex gestures. And thanks to clever detection of gestures that you perform in characteristic ways, the iDevices may be able to use your moves as a security key. 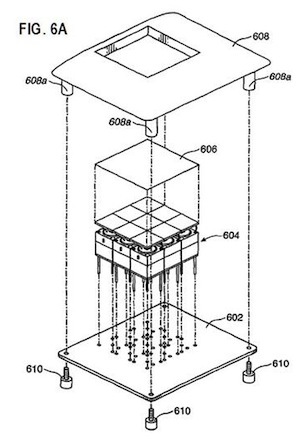 The other thing to note is that it’s not just about touching the screen–Apple’s patent mentions “hover” sensitivity, which could work via an expansion of the existing transparent capacitor tech used to detect touchscreen contact nowadays. By opening up gestures via non-touch screens, Apple really could be taking the natural user interface into a whole new era. 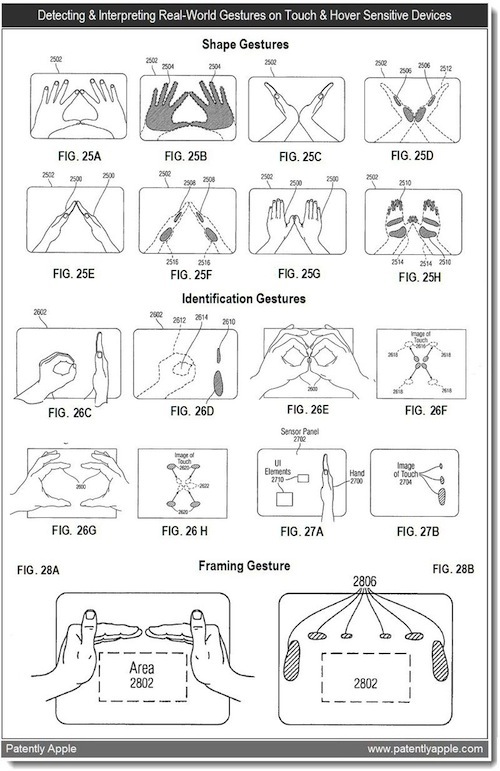 Then there’s an even more intriguing patent, RE42,064 which describes “haptels.” These are “a grid of haptic elements” hidden beneath the flexible surface of a touchscreen. The idea is that just as a touchscreen has touch “pixels” to work out exactly where your fingers are touching it, a future device may have tiny motion-delivering haptic pixels that feed back information directly to your fingers. Imagine a touchpad that slightly morphs to create a “dimple” for your finger to find when you’re looking to close a window, or one that replicates the edges of an image you’re editing on-screen, helping you make precise location choices with the touchpad. We’re convinced we’ll eventually see some of these in real life because as the public becomes more familiar with multitouch technology and other “natural user interfaces” (also being pushed by Microsoft) they’ll expect to be able to interact in more sophisticated ways with their devices–and an expansion of touch and gesture technology is absolutely the way to do this.